During the Death Magnetic album sessions in 2007 and 2008, we originally recorded 14 songs. When it came time to pick the songs for the final album, we decided on 10 songs that you've all come to know over the last three years... Some of you may have heard bits and pieces of those other songs on 'Mission Metallica' (remember 'Mission Metallica'?!) or heard rumors about them during the recording process, and wondered, 'What ever happened to those other four songs???.' We kept them in the vault and decided to pull them just for this special celebration, so here are the four leftover tracks from the Death Magnetic sessions. They are ROUGH mixes, unfinished to their original degree of mixing from March '08. These four songs were released as a gift to our closest fans, the members of our Fan Club, to enjoy. Now they're being made available to you. On January 3, 2012, Metallica announced that Beyond Magnetic was to be released as a CD on January 31 in the US and January 30 internationally. It was also announced that the EP would be released on vinyl, and would be made available on April 21 in celebration of Record Store Day. Reviews of Beyond Magnetic have been largely positive. AllMusic gave Beyond Magnetic a rating of 4 out of 5 stars, and reviewer Stephen Erlewine called the EP "as potent as its 2008 parent." During its first week of release, Beyond Magnetic sold 36,000 copies and peaked at number 32 on the Billboard 200. All lyrics written by Hetfield; all music composed by Metallica. Writing, performance and production credits are adapted from the album's liner notes. ↑ "BLABBERMOUTH.NET - METALLICA's 'Beyond Magnetic' Cracks U.S. Top 40 - Dec. 21, 2011". Roadrunnerrecords.com. Retrieved 2011-01-09. ↑ "News | Four Previously Un-released Tracks On iTunes". Metallica.com. 2011-12-12. Retrieved 2011-12-16. ↑ "BLABBERMOUTH.NET - METALLICA Releases 'Beyond Magnetic' Digital EP". Roadrunnerrecords.com. Retrieved 2011-12-16. ↑ "Metallica releases Beyond Magnetic EP". Consequence of Sound. December 12, 2011. Archived from the original on December 21, 2011. Retrieved December 22, 2011. ↑ "METALLICA: 'Beyond Magnetic' To Receive CD Release". Blabbermouth.net. January 3, 2011. Archived from the original on January 4, 2011. Retrieved January 4, 2012. ↑ "Metallica's 'Beyond Magnetic' EP to Receive Vinyl Release". Blabbermouth.net. Retrieved March 3, 2012. ↑ Young, Alex (January 30, 2012). "Metallica – Beyond Magnetic EP / Album Reviews". consequenceofsound.net. Consequence of Sound. Retrieved July 19, 2015. ↑ Fisher, Mark. 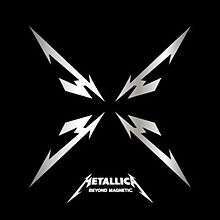 "METALLICA – Beyond Magnetic (2012) / Album / EP Reviews". www.metalforcesmagazine.com. Metal Forces. Retrieved July 19, 2015. ↑ Fricke, David (February 23, 2012). "Metallica Beyond Magnetic Album Review". www.rollingstone.com. Rolling Stone. Retrieved March 16, 2012. ↑ "METALLICA's 'Beyond Magnetic' Cracks U.S. Top 40". Blabbermouth.net. December 21, 2011. Archived from the original on December 21, 2011. Retrieved December 22, 2011. ↑ Beyond Magnetic (liner notes). Metallica. Vertigo Records. 2012. ↑ "Australiancharts.com – Metallica – Beyond Magnetic". Hung Medien. ↑ "Metallica – Chart history" Billboard Canadian Albums Chart for Metallica. ↑ "Top 40 album DVD és válogatáslemez-lista – 2012. 6. hét" (in Hungarian). MAHASZ. ↑ "Oricon Top 50 Albums: 2012-03-19" (in Japanese). Oricon. ↑ "Charts.org.nz – Metallica – Beyond Magnetic". Hung Medien. ↑ "Official Scottish Albums Chart Top 100". Official Charts Company. ↑ "Official Rock & Metal Albums Chart Top 40". Official Charts Company. ↑ "Metallica – Chart history" Billboard 200 for Metallica. ↑ "Metallica – Chart history" Billboard Digital Albums for Metallica. ↑ "Metallica – Chart history" Billboard Top Alternative Albums for Metallica. ↑ "Metallica – Chart history" Billboard Top Hard Rock Albums for Metallica. ↑ "Metallica – Chart history" Billboard Top Rock Albums for Metallica. ↑ "Metallica – Chart history" Billboard Top Tastemaker Albums for Metallica.